The important things to remember about UFOs are, first, that they are just alleged sightings that are unidentified—that is, they are not proof of anything—and, second, that eyewitnesses make identification difficult by so often being mistaken. As UFO investigator Allan Hendry (1979, 6) aptly noted, “We only get to study reports of UFOs—not the UFOs themselves. The term UFO is problematic. Often the phenomenon is neither “flying” nor an “object”; consider, for example, a bright disc that is really only the effect of a searchlight playing on a low cloud layer. Unidentified aerial phenomenon would be a more inclusive term (although itself not always accurate), but it seems we are stuck with UFO. Unfortunately, UFOs are mostly reported by untrained observers—those lacking necessary expertise in astronomy, atmospheric phenomena, aeronautics, physics, and perception, among other factors (McGaha 2009; Frazier et al. 1997). So, the widespread attitude that because they are unidentified they are therefore probably extraterrestrial craft is a logical fallacy called arguing from ignorance. Sightings are influenced by the conditions under which they are observed. For example, bright stars and planets may become UFOs due to being watched from a moving car and thus seeming to keep pace with it (Hendry 1979, 27). An important basic observation-related fact is that neither an estimate of the presumed craft’s distance from the viewer nor its size or speed can be made unless one of the factors is known. With multiple unknowns, one is simply engaging in the wildest guessing. If the guess as to one of the three factors is in error, the others will be wrong accordingly. 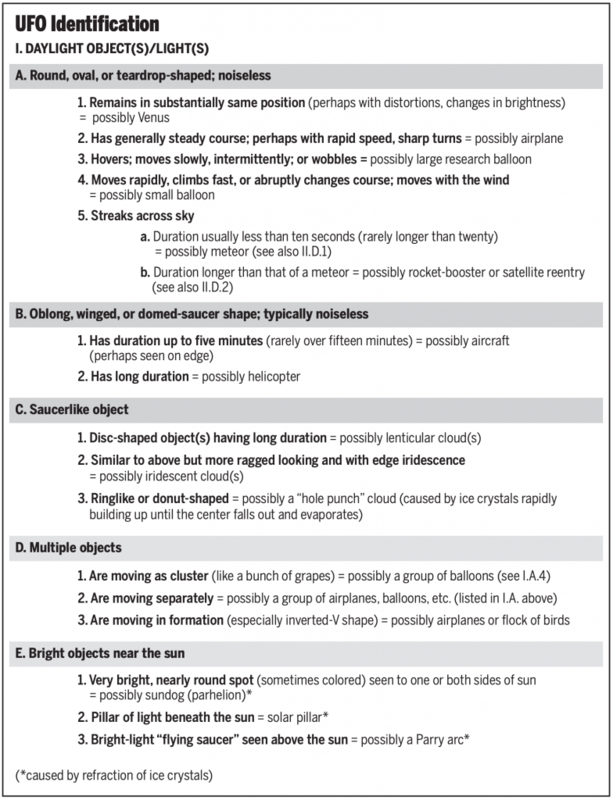 The only way to objectively evaluate an object or light in the sky is by first characterizing it with (1) angular velocity (how fast it is moving through the sky, measured in degrees per second), (2) angular size (measured in degrees—for example a full moon subtends an angle of half a degree), and (3) angular position (measured in degrees of altitude and azimuth). For our purposes here, we define illusion as a deceptive but objectively existing image—that is, something that can actually be seen (and photographed), such as a mirage. We distinguish this from the mental image that is imaginary, hallucinatory, or the like, understanding that one can transform an objective image into something quite different by mental action (for example, one’s expectation may transform a light into the perception of a shiny metallic object). Various common illusions need to be understood. One can occur when the observer stares at a bright light in the dark, whereupon it may seem to dart about, zigzag, wobble, etc. This can be caused by the natural, involuntary jerking movements of the human eye and is known as the autokinetic effect (Hendry 1979, 26, 44, 95). Another illusory effect includes the movement and flashing of colors that are sometimes ascribed to a bright UFO seen at night. Called scintillation, it causes the “twinkling” of stars due to atmospheric turbulence—or of planets when our atmosphere is especially turbulent. It may occur even on a clear night and can affect a single celestial light (Hendry 1979, 26). Indeed, scintillation can affect any visible point of light. The effect results from refraction (bending) of the different wavelengths, producing (to the eye or camera) the changing colors and motion. An illusion of hovering can occur when, for example, a slow-moving craft flies directly toward or away from the observer. This gives the impression that the “UFO” is remaining motionless and thus “hovering.” In one case, a New Hampshire UFO with colored lights appeared to remain stationary for a minute before it “moved away” from the observers “as if sensing their approach.” It was, in fact, a well-lit airplane, a DC-9, making its final approach to an airport. In one instance a UFO—another plane—was reported “hovering” in the distance for some twenty minutes (Hendry 1979, 37–38). Size can also be illusory. For example, it is a human tendency that the brighter a light appears, the larger it is perceived. The dramatic “disappearance” of a UFO may occur for a variety of reasons. An aircraft may shut off its bright lights or change the angle at which the observer views it. As well, a star, perhaps watched for a long time due to its flashing colors, may be obscured suddenly by moving clouds (Hendry 1979, 26, 38). Many illusions occur in daytime as well. For example, a UFO that appears to move against the wind, and so supposedly cannot be a balloon, may be propelled by high-altitude winds that can differ in direction from ground winds (Hendry 1979, 61). Many things can go unidentified in the day or night sky, particularly to untrained observers—as most people are. (Interestingly, according to one study [Hynek 1977, 261] even pilots make “relatively poor witnesses”—no doubt because they are trained to fly airplanes, not identify a UFO under unknown and perhaps unusual conditions.) The following flying-saucer impostors offer specific identification problems. Stars and Planets. Bright stars and planets represent the primary UFO impostor. As we saw earlier, their seeming ability to dart, wobble, or zigzag and to change color rapidly (the effects of autokinesis and scintillation—especially when exaggerated by binoculars and telescopes) make them ideal candidates for UFOs. Certain stars (Antares, Arcturus, Capella, Sirius, and Vega) and planets (Jupiter, Mars, occasionally Saturn, and especially Venus1) prompt some eyewitnesses to insist their UFO “was too bright to be a star” (Hendry 1979, 24–31; see also Sheaffer 1980). Airplanes. These frequently become UFOs, such as when seen head-on and so resemble a classic flying-saucer in edge view. Not only can aircraft seem to hover (as explained earlier), but they “are capable of performing side-to-side motions, climbing vertically, descending and changing direction abruptly.” Also, rows of anti-collision lights on the wings, blinking sequentially, can give the impression that they—and the craft—are rotating. Significantly, “One of the leading causes of surprise is the inability of the reporting witness to hear any noise from the aircraft.” Indeed, “even low-flying aircraft like advertising planes [now scarce] have a 91 percent occurrence where no sound is ever heard by the reporting witness.” Helicopters likewise often go unheard, and they are also capable of particular freedom of motion (Hendry 1979, 38, 40). Meteors/Fireballs. A meteor is the flash of light from a stony or metallic celestial object that burns due to friction upon entering Earth’s atmosphere; a fireball is a very bright meteor (brighter than Venus). Meteors may be seen any time of night—and fireballs day or night—during any part of the year. However, they are most likely to be seen during major meteor showers that occur on certain peak dates (give or take a few days): the Quadrantids (January 4), Perseids (August 12), and the Geminids (December 13). Notably, “since we are only viewing an apparent trajectory along our line of vision, any meteor/fireball can appear to adopt any direction and angle including upward, and it need not move in a curving path.” Usually, the paths of meteors/fireballs (and of re-entry of space debris) are short and the duration measured in seconds (but as long as three minutes for re-entry objects). Few meteors/fireballs are heard (Hendry 1979, 41–44). Balloons. Balloons are chameleons of the sky. A research balloon can achieve high altitudes and reach speeds of over 200 miles per hour (seeming to be faster if its size or altitude is misestimated). It can stop, seem to hover, move erratically, or execute sharp turns—depending on the winds. It can even appear to change shape and color. Depending on how sunlight strikes its surface, the balloon can appear to be white, metallic, red, glowing, and so on. At a distance, a balloon loses entirely its three-dimensional spherical aspect. It takes on the appearance of a disc. From beneath, instruments hanging below the balloon’s center, can easily be mistaken for a “hole,” giving the disc the shape of a doughnut. If viewed from the side, the disc seems to be flying on edge, like a rolling wheel. Others. While stars, aircraft, and meteors account for the greatest proportion of UFO reports, other phenomena also represent significant UFO impostors. These include those “nocturnal lights” UFOs subsequently identified as satellites, searchlights (playing on clouds), prank balloons, and others, including flares. Flares are not reported often as UFOs, but when they are they prompt some of the more sensational cases.2 “Daylight disc” UFOs that subsequently become identified include weather balloons, aircraft, meteors, Venus (again), certain cloud effects, and even birds. Radar anomalies were once common but of little evidential value due to the number of known natural causes for them. Such anomalous radar targets—called “angels”—have been eliminated by modern radar. However, they are still cited in older cases where they may be attributed to birds, smoke, dust clouds, areas of atmospheric turbulence—even reflecting layers in the atmosphere returning echoes of fixed or moving objects on the ground (Klass 1976, 208–210). Radar-visuals represent the supposed matching of a radar return and a sighting of a UFO, but once again investigation converts some of these UFOs to IFOs—prank balloons in some cases. False correlations have occurred in other instances, such as a supposed match between a scintillating star and a supposed radar return that was instead attributable to ground clutter (Hendry 1979, 70–71; for more on radars and UFOs, see Klass 1976, 207–219). 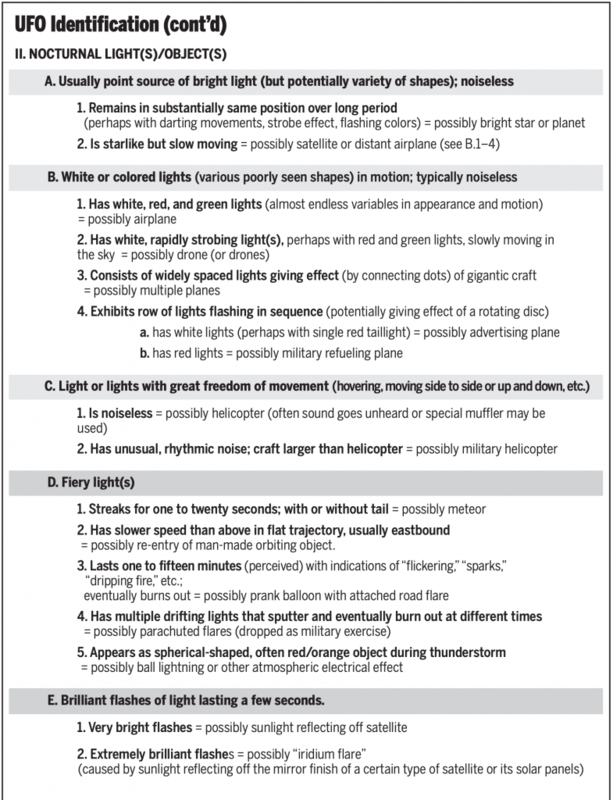 Although there are countless other potential UFOs, this discussion and accompanying chart should prove helpful as a first-look source in the identification process. Venus can be eighty times brighter than surrounding stars and is most often seen in twilight (because the angular separation from the sun can never be greater than 47°). See, for example, “The Stephenville Lights: What Actually Happened,” Skeptical Inquirer, January/February 2009, 56–57. This represents a detailed investigation by James McGaha. Frazier, Kendrick, Barry Karr, and Joe Nickell, editors. 1997. The UFO Invasion. Amherst, NY: Prometheus Books. Hendry, Allan. 1979. The UFO Handbook: A Guide to Investigation, Evaluating and Reporting UFO Sightings. Garden City, NY: Doubleday. Hynek, J. Allen. 1977. The Hynek UFO Report. New York: Barnes & Noble. Klass, Philip J. 1976. UFOs Explained. New York: Vintage Books. McGaha, James. 2009. The trained observer of unusual things in the sky (UFOs?). Skeptical Inquirer 33(1) (January/February): 56–57. Sheaffer, Robert. 1980. The UFO Verdict: Examining the Evidence; reprinted Amherst, NY: Prometheus Books, 1986. Joe Nickell, PhD, is a skeptical UFOlogist and author of many articles on extraterrestrial visitation, a coeditor of The UFO Invasion, and contributor to The Encyclopedia of Extraterrestrial Encounters. James McGaha, major, USAF retired, is a former special operations and electronic warfare pilot and now an astronomer and director of the Grasslands observatory in Tucson, Arizona.